We have some new information to follow up on Monday’s news that the late fall 2014 sailings the Disney Dream are being modified to accommodate the Disney Magic at Port Canaveral. There were two email notices sent to travel agents today. 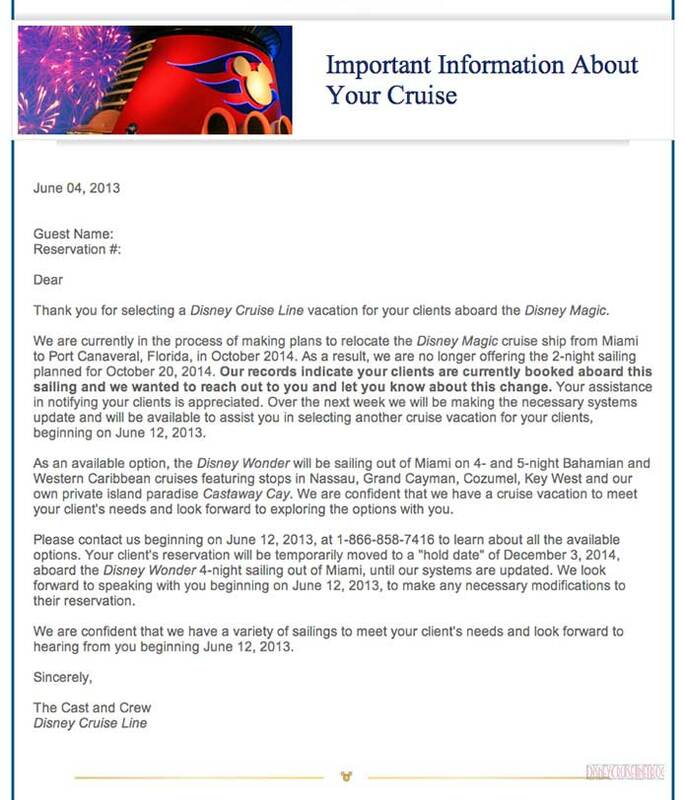 The first notice was to inform passengers booked on the October 20, 2014 2-Night Cruise to Castaway Cay that the cruise has been canceled. If you were booked on this sailing, your reservation will be moved to a hold date of December 3, 2014, which is a 4-Night sailing on the Disney Wonder. 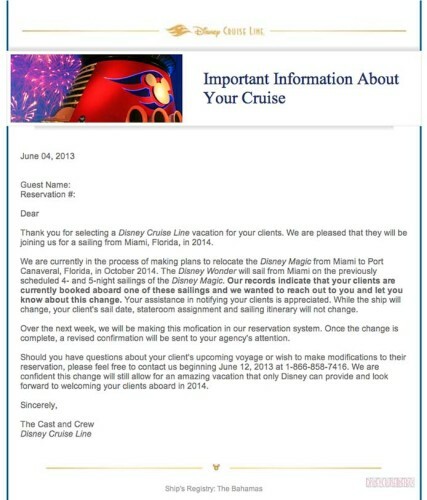 Those affected can contact Disney Cruise Line starting June 12, 2013 to adjust this reservation. Included in this email, it was announced that the Disney Wonder will be sailing from Miami in place of the Disney Magic on four and five-night Bahamian and Western Caribbean cruises. The Western Caribbean cruises will feature stops at Grand Cayman, Cozumel, and Key West. The second email sent to travel agents this morning solidified the fact that the Disney Magic and Disney Wonder would be swapping home ports in October 2014. The Disney Wonder will be taking over the previously scheduled four and five-night Disney Magic sailings. Based on the itinerary brochure we picked up on the Disney Fantasy in March, the Disney Wonder was originally slated to sail on 7-Night Western Caribbean sailings from Port Canaveral beginning in November 2014 while the Disney Magic was sailing from Miami. It is now probable, based on the Grand Cayman port calendar we shared yesterday, that the Disney Magic will be sailing those 7-Night Western Caribbean Cruises. It was confirmed (see update below) today, that the Disney Magic will indeed be sailing the 7-Night Western Caribbean itinerary leaving on Sundays from Port Canaveral. The itinerary pages for each ship have not been updated. I am going to wait until the dust settles before making any changes. UPDATE: I heard back from Disney Cruise Line this afternoon, and it has been confirmed that the Disney Magic will be sailing on 7-Night Western Caribbean cruises from Port canaveral. Below is an excerpt from the response I received from Rebecca Peddie, Manager Public Affairs at Disney Cruise Line. To provide guests with a greater mix of longer Disney Cruise Line vacation options, we are relocating the Disney Magic cruise ship from Miami to Port Canaveral beginning October 21, 2014. With this change, the Disney Magic will sail from Port Canaveral on Sundays to the Western Caribbean, and the Disney Wonder will return to Miami beginning October 11, 2014, offering 4- and 5-night sailings. To accommodate the Sunday departures of Disney Magic, the Disney Dream cruise ship will depart from Port Canaveral on Mondays and Fridays beginning on October 23, 2014. 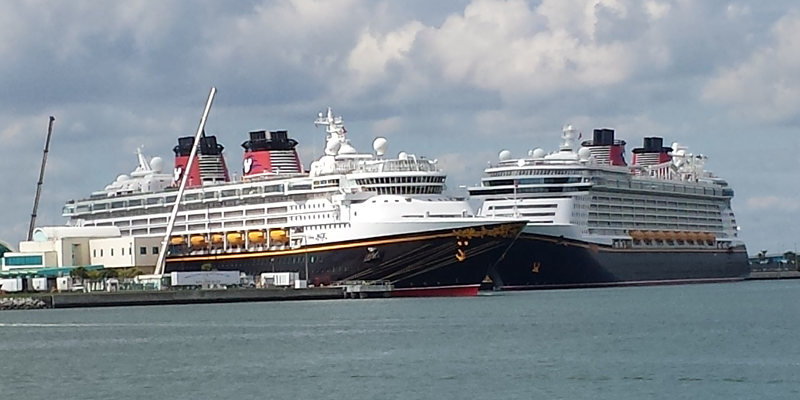 This entry was posted in Itineraries, News and tagged 2014, Disney Magic, Disney Wonder, Miami, Port Canaveral by Scott Sanders. Bookmark the permalink. Any news if the Wonder will be getting the bells and whistles that the Magic will be getting shortly! Lisa, DCL has not commented on the Disney Wonder’s dry dock. We are only speculating now that what you see arriving to the Magic will end up on the Wonder. I “Wonder” when the major dry dock for the Wonder will be? Won’t be Oct-Nov 2014 as you speculated earlier? We were told by multiple people on the Wonder last week that the dry dock schedule had been changed. “Rumor” is the Dream will be getting a dry dock in 2014 in the Bahamas, followed by the Wonder refurb in 2015, also supposedly taking place in the Bahamas. It was said they would not be getting all the same changes as the Magic, some things would be different. I can’t wait to see fares for the 7 night on the Magic. We are booked on her for March 2014 for 4 nights. When will the reservation system show the new sailings? Have there been any changes for the fantasy? We’re planning a 2015 eastern Caribbean on the fantasy.. Do you think that will change? Anything is possible at this point, but I would bet the Fantasy will still be sailing Easterns in 2015. We just got off the Magic yesterday – after 21 days onboard it seemed like home. We were told the Wonder major dry dock is being re-evaluated due to the delay in completion of the Panama Canal work to widden the canal. The addition of the fish tail to the Magic and Wonder, to increase stabililty and decrease fuel consumption, widdens the ships beyond the maximum of the current canal. We were given a tour of a cabin which has been refitted with the new rugs and furniture which will be going in during the remodel. It did not have the new bedding nor new currents. It looks very nice, with a bit less storage in the furniture but wonderful access to under the bed, like the new ships. Any new word on when we can make the change off of the Wonder and back to the Magic? Someone heard rumors that we could change on the 12th if we were already impacted by the changes. Any merit to this? That is what was stated in the original emails. I thought it got changed to the 18th, but I was unsure if this was only for new reservations. I would say call tomorrow just to be on the safe side. Does anyone have a link to the updated DCL 2014 brochure pdf? Thanks in advance! Scott – do you know if there is something special/different about the October 21, 2014 sailing of the Magic? A few months ago we booked a category 4E for $3038 and now it is pricing at $5793. All categories have gone up almost $3000. Fundraiser cruise maybe? I’ve not heard about anything special for that sailing. Prices do follow the supply/demand formula. The prices do increase as the categories fill up. Then closer to the sailing there may be deals to fill the rest of the staterooms. Thanks Scott. Keep me in mind if you hear anything.